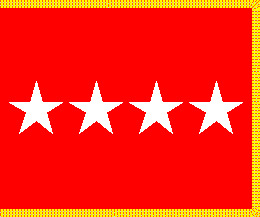 These U.S. Army 4 star General Flags are made to official U.S. Government Specifications (G-Spec). These flags feature the appropriate Army General star field appliqued onto heavyweight SolarMax (TM) nylon or rayon fabric. Available with grommets, for attaching to a lanyard, or with a Pole Hem only (PH) or Pole Hem & Fringe(PHF) for indoor display. 3' x 5'- Available in Nylon only. Please allow 2 weeks for shipping as these flags are custom made. 100% made in the USA .